#2NITE Money. At the root of all evil acts you will find #racks of these promissory notes written on whipped cotton. Money. 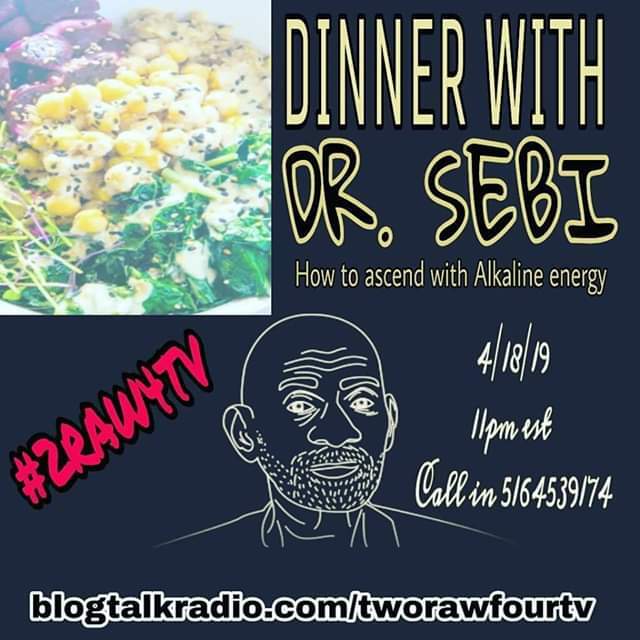 #DrSebi was kidnapped by police with literally hundreds of thousands in his hands. He was never seen alive again. #NipseyHussle was murdered a millionaire in front of his own store. Both of these powerful men believed in uniting Black people worldwide, destroying the lies of #pinkpower, and economic empowerment. Both of them had the capital to make a difference, and in the end it did, it turned them from breathing beings to ancestors taken from us too soon. Next #2RAW4TV will be a bitter pill of truth to those infected by #whitelies. 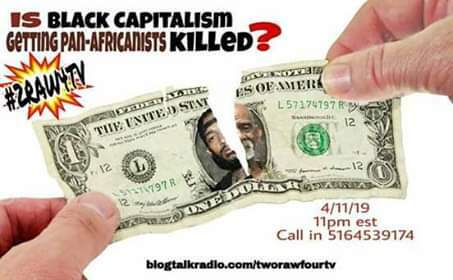 IS BLACK CAPITALISM GETTING PAN AFRICANISTS KILLED? We will not only examine this question but a revolutionary panel will offer solutions. 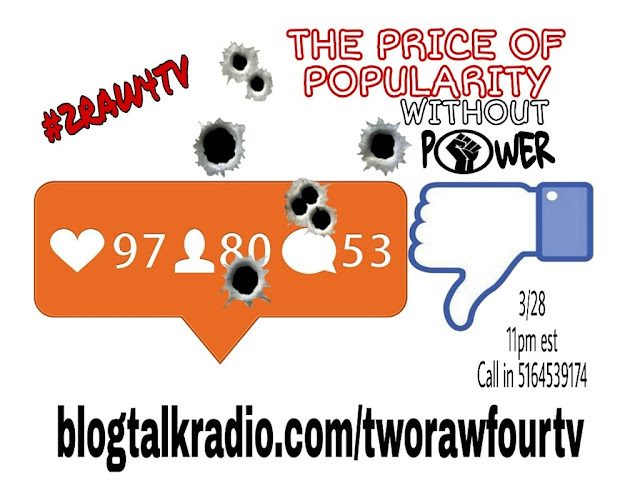 Money will not save you, however the next broadcast of 2RAW4TV will. #Turnoffyourtv and #Tunein! What does #popularity without power look like? Does it look like #mumblerappers with millions of likes, hearts, and "followers" who incoherently mutter about shooting at "opps" only to rat peacefully to cops? Is it once famous tv icons and singers who find themselves at the ropes end of internet-group-think lynch mobs, their bodies swinging lifelessly in the gallows of pre approved public opinion? We know what that looks like, better question, what does #power look like? Is power the reason you pull out a cell phone instead of a pistol when the police are unjustly wrangling a child to the ground? Is power the reason you pay rent, water, gas, and tax to people you will never see? Fame is a game given to the powerless who misinterpret it as power when it is the exact opposite. The most "powerful" people are rarely seen or heard, in fact, some are very unpopular, nevertheless they get their way. Even if that way is against all sense and sensibilities, you better deal with it. Well, those days are done! 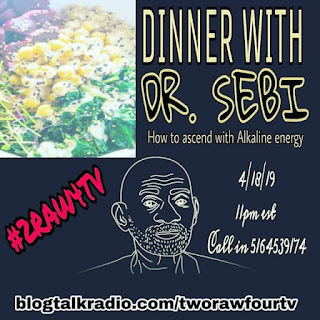 Next #2RAW4TV we will discuss how to amass true power, how to get things done without red tape, rules,and regulations. Also how to convert #facebook likes into real life manifestations. THE PRICE OF POPULARITY WITHOUT POWER is death by 1000 "likes" however after next broadcast the hunted will become the hunters and we will reveal a truth no other media outlet is talking about. Plus New #Music, new ideas, and new dimensions all this this Thursday! #turnoffyourtv and #Tunein!! 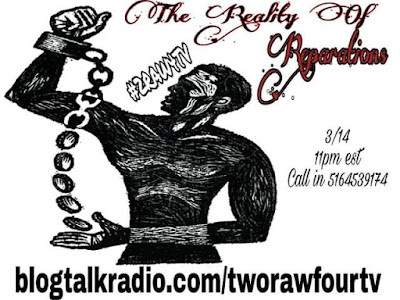 #2NITE The conversation about #reperations is changing and becoming a serious one with serious consequences. Black people are not going to entertain any politicians that don't speak the language of #Blackfirst. It's really an important time to be alive, present, in the moment, as pink power is painted in a black corner. Either give up tangible compensation or else. If you're not awake now you will never be. However, what price point can you put on hundreds of years of suffering, servitude, and slavery? What land can you give that hasn't been saturated in the blood of Black royalty? Next #2RAW4TV we are going to explore the raw truths about the reparations movement that nobody is talking about, THE REALITY OF REPARATIONS. The demands must be strong but the repercussions must be stronger. #Turnoffyourtv and #Tunein to this epic discussion on this pivotal matter. 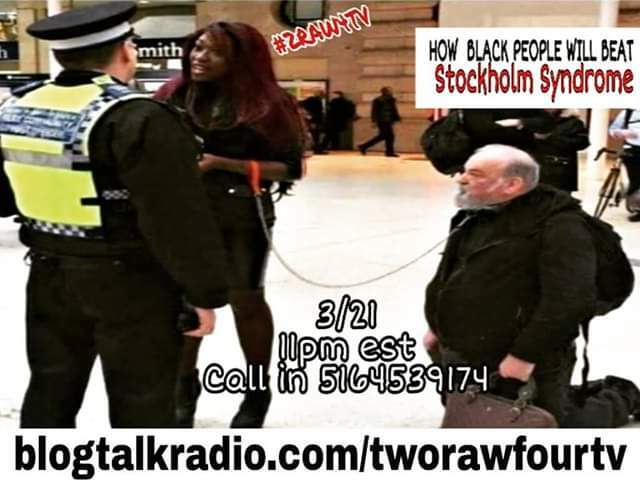 blogtalkradio.com/tworawfourtv #therevolutionwillnotbetelevised #ADOS #tangibles2020 #BernieSanders #BlackAgenda #MAKEATLANTABLACKAGAIN #BlackDivinity #BlackSupremacy #ifyouhearmyvoicethenyourepartoftherevolution #2RAW4TV. Black people can not be #racist. At least they can not weaponize the systems that use racism like law enforcement, schools, and military against other racial identity groups. Truly, Black people can only usurp pink power viciousness against another Black person. When inflicting pain on one another Black people channel their inner Klans men and act just as maliciously as the worst element of our society. 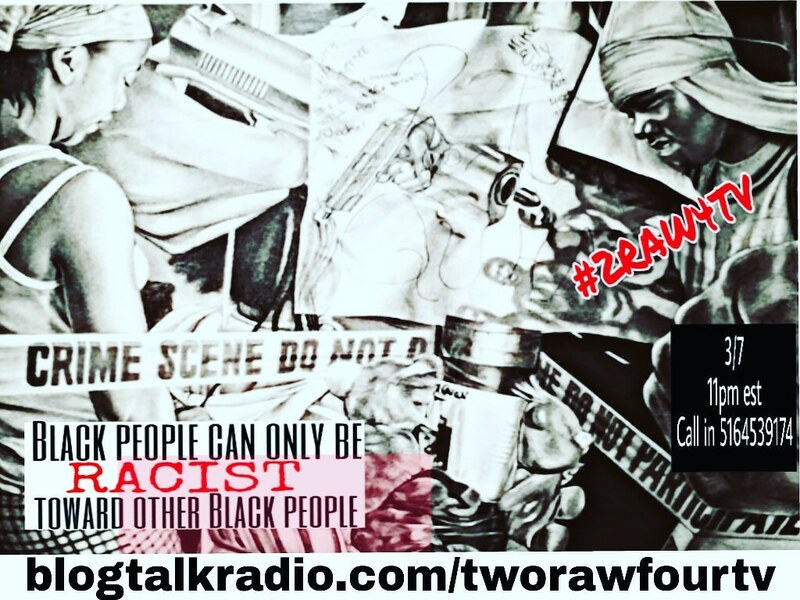 Next #2RAW4TV we will discuss how BLACK PEOPLE CAN ONLY BE RACIST TOWARD OTHER BLACK PEOPLE. Once we expose the mental illness that makes Black people hate Black people the most we will have a panel discussion on how to destroy the last, yet most damaging vestige of slavery, Self Hate. 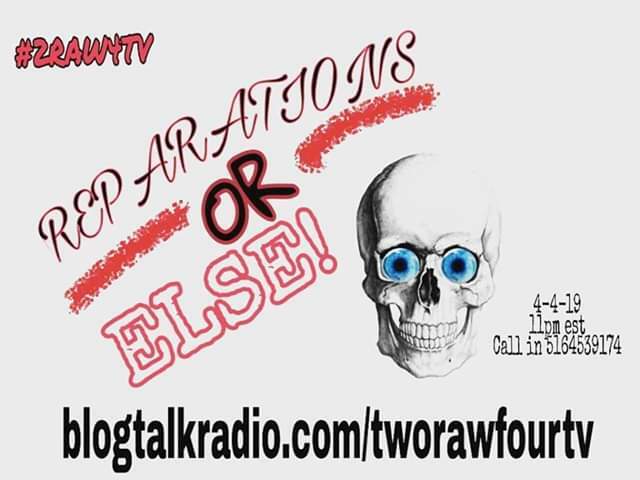 After this next broadcast there is no turning back, #turnoffyourtv and join us!